“Well I will tell you what, women and men across America know that is just a really weak excuse for behaving badly and mistreating people,” Clinton continued. 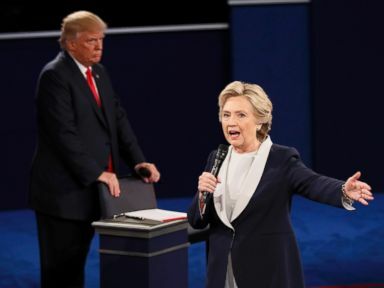 At the debate, Trump shrugged off the growing uproar over the video, dismissing calls for him to drop out of the election and saying he had moved on from the controversy. But Trump raised additional alarm in the Clinton camp prior to the debate when he invited accusers of former President Clinton to join him for a brief press conference. Today, it was Hillary Clinton’s turn to brush off Trump’s attacks. “One of us went high and one of us went low,” said Clinton, invoking First Lady Michelle Obama‘s oft-repeated campaign missive. “He has been taking from America with both hands, and sticking the rest of us with the bill,” she said.